Venezuela is a "national security threat" only because it refuses to be controlled by the US. 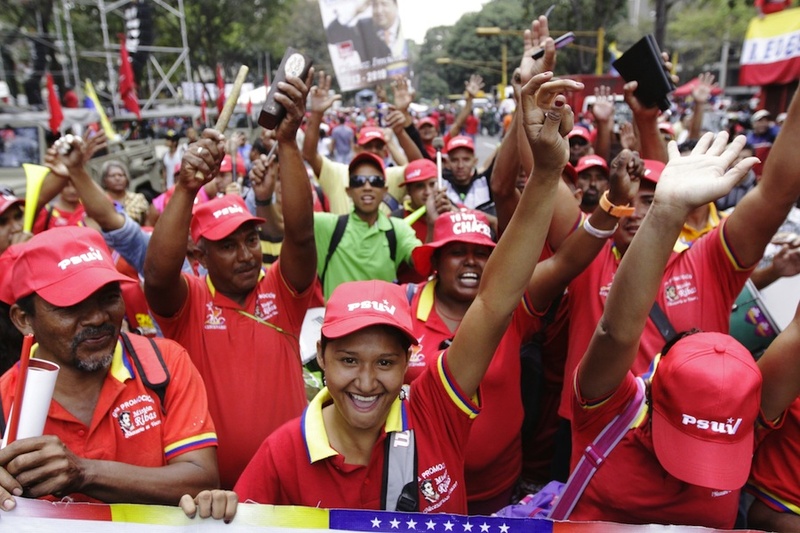 Chavistas at a rally in Venezuela. There’s a lot of confusion about what’s going on in Venezuela. Following the death of President Hugo Chavez in 2013, the left-wing government of Nicolas Maduro has dealt with goods shortages, growing inflation, and civil unrest. Here’s George Ciccariello-Maher with some key points about the situation in the country and recent provocations from the United States. On March 9, the Obama administration issued an executive order declaring Venezuela a threat to US national security and imposing sanctions on several individuals. What’s the backstory? The pretext for these sanctions is so-called human rights abuses that occurred more than a year ago, during a wave of street protests against the government of Nicolás Maduro. I say so-called because what actually happened in the streets a year ago has been systematically misrepresented. The opposition narrative is one of spontaneous, peaceful protests by all Venezuelans against a tyrannical government — in the vein of the Arab Spring or the Occupy Movement — to which the government responded with brutal repression. The reality was very different: the protests were hardly spontaneous, and in fact part of a strategy by the radical right-wing sector of the opposition to overthrow a democratically elected government. The means were far from peaceful, and while in some cases the police and national guard responded brutally, they were on the whole incredibly patient with the protesters, who they allowed to blockade entire areas of cities for more than a month. In the end, the forty-three deaths were distributed evenly among Chavistas, the opposition, and security forces. But while many of the police responsible for violence were arrested, the same can’t be said for the protesters who, for example, decapitated motorcyclists with barbed wire and sniped at police from rooftops. And their constituency was far from “all Venezuelans” — nearly all the protesters were from the middle and upper classes, as were the neighborhoods that saw protests. During the 2014 protests, the Obama administration insisted that the sanctions being pushed by Florida Sen. Marco Rubio and others would be counterproductive. What changed? The timeline is very revealing. On December 17, 2014, the Obama administration announced a historic thaw in relations with Cuba, and on it December 18, 2014, announced a first round of sanctions on Venezuela — this only a week after the release of the Senate torture report. The second and most recent sanctions announcement came a mere five days after the release of the Department of Justice’s Ferguson report. And yet, irony of ironies, the White House has the temerity to accuse Venezuela of trying to “distract” attention from internal problems by inventing threats abroad. But this distraction also serves an electoral purpose: while thawing relations with Cuba is increasingly popular among a younger generation of Cubans in Florida, it runs the risk of pushing more hardline elements — who are also very wealthy — into the Republican camp, especially if Rubio winds up running for the presidency. So by making Venezuela the new Cuba, the new international pariah, the Democrats are trying to have their cake and eat it too (my apologies to Emiliana Duarte for the metaphor). But if the sanctions will be “productive” in Florida, won’t they still be counterproductive in Venezuela? Absolutely — and it’s hard to understand how the Obama administration could fail to see this. While the Venezuelan opposition in Venezuela is almost as delusional as the Venezuelan self-exiles in Miami, there’s one big difference: opposition leaders on the ground have to live with the consequences of their catastrophic decisions. What that means in this case is that, while radical right-wingers in Florida may be celebrating the sanctions, it would be suicidal for the opposition in Venezuela to do the same. They would simply prove what Chavistas already believe: that they are treasonous lapdogs of imperial power. The Venezuelan opposition is a walking contradiction. Unable to become a majority, it is perennially torn between participating in elections it will almost certainly lose and boycotting them. It can’t win as long as it is seen as undemocratic, and boycotts and coups only support this view. It lacks a political program or any proposals whatsoever, because any proposals it would make would be deeply unpopular. And so the opposition swings wildly between lost elections and failed insurrections, each only confirming the other. So the concurrence of Cuban thaw and Venezuelan winter is no coincidence. But this attempt to keep Florida in the Democratic column comes at the expense of political rationality. And it shows yet again that Miami itself, the zone where Venezuelan and Cuban terrorists walk free as political kingmakers, is a severe liability for the opposition. Some among the opposition recognize this, even constructing farcical conspiracy theories about Obama secretly wanting to keep Maduro in office. What about Maduro’s claims to have dismantled a coup plot? Here’s a second way that Obama’s executive order has been completely counterproductive. When the Maduro government recently announced the discovery of yet another coup plot, arresting several military officials as well as the opposition mayor of greater Caracas, Antonio Ledezma, the international media narrative was clear: here was a paranoid despot imagining threats and imprisoning his political enemies. Despite the increasing evidence of the coup-plotting and despite Ledezma’s own brutal past and insurrectional calls in the present, even many Venezuelans were likely feeling some coup fatigue. This isn’t to say that the threat is imagined. Just the opposite: there have been so many plots that even the very real threats can seem more a part of everyday life — a “continuous coup,” in the words of some. The executive order simply confirms this, by making it absolutely clear that the United States supports regime change in Venezuela (hence the comical interaction between US State Department spokeswoman Jen Psaki and Associated Press reporter Matt Lee). Maduro has taken full advantage of this clear violation of Venezuelan sovereignty, rallying an anti-imperialist front at home — giving some much-needed respite from economic challenges — and even securing a unanimous call by the Union of South American Nations to revoke the sanctions. So, is Venezuela a threat? Venezuela is a threat like Mike Brown was a threat, like Trayvon Martin and Oscar Grant were threats, like CeCe McDonald is a threat, like it is threatening to even say “black lives matter” to a system that every day proves otherwise. Venezuela is a threat in the same way that FBI Director J. Edgar Hoover once declared the Black Panther Party “the greatest threat to the internal security of the country.” Venezuela is a threat like Ferguson is threat incarnate: both clearly show the world-making role of popular insurrections, riots, and rebellions, that what is made can be unmade and made again. Venezuela is a “national security threat” only because it refuses to be controlled by the US.